So I didn’t look for the cache at Wal-Mart this morning as the landscape crew was nearby. Well, I decided to bite the bullet today and drive inland toward Crater Lake. The scenic byway began at a lower elevation in Roseburg, so I figured I could at least enjoy a handful of stops in Umpqua National Forest if Crater Lake wasn’t feasible. 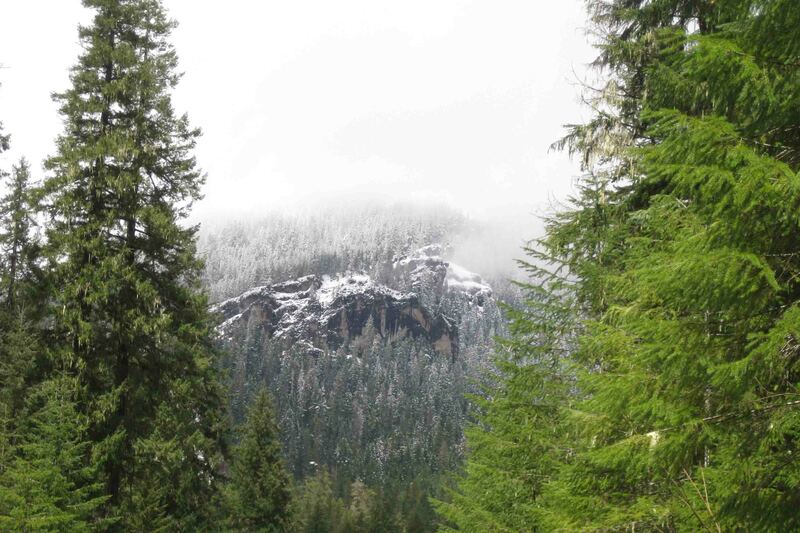 As I headed east in the rain to Colliding Rivers Viewpoint at less than 1,000 feet elevation, I wondered if that meant snow when I reached the 5,000 pass. 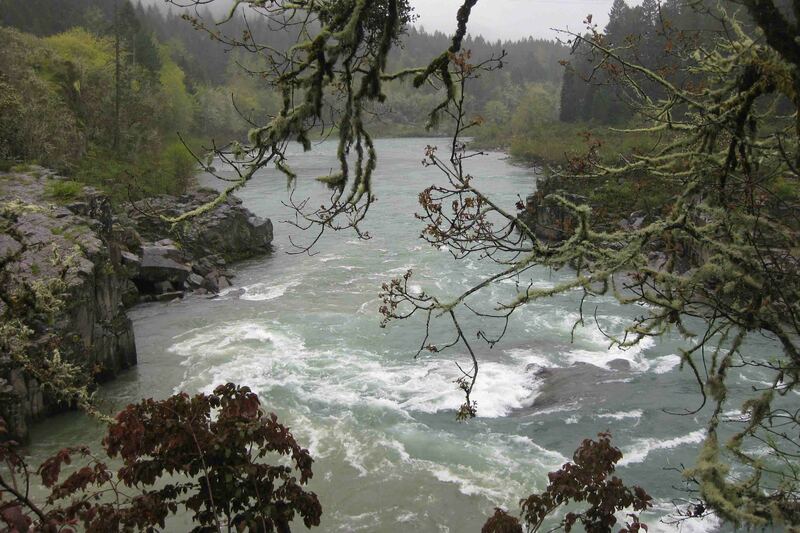 The Colliding Rivers Viewpoint, which for millions of years sat beneath the Pacific Ocean, is now the location where the Little River and the North Umpqua River collide. 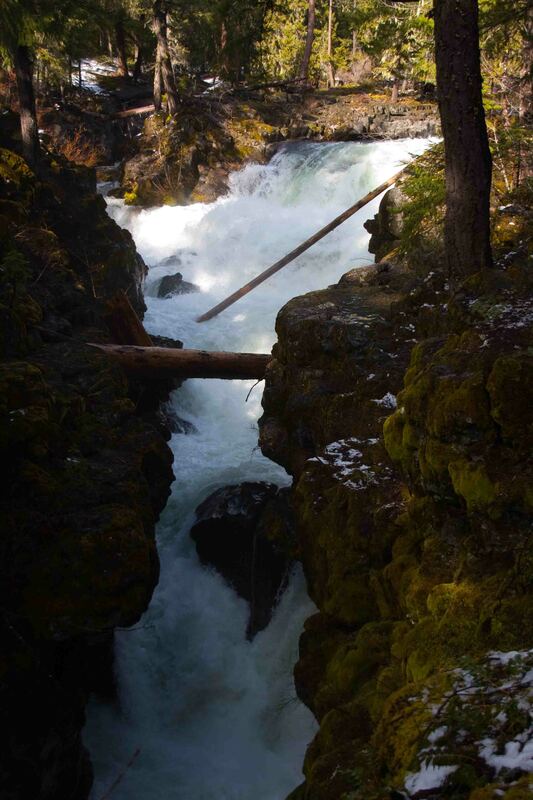 The two rivers collide due to resistant sills of Basalt that deflect the rivers into a collision course. 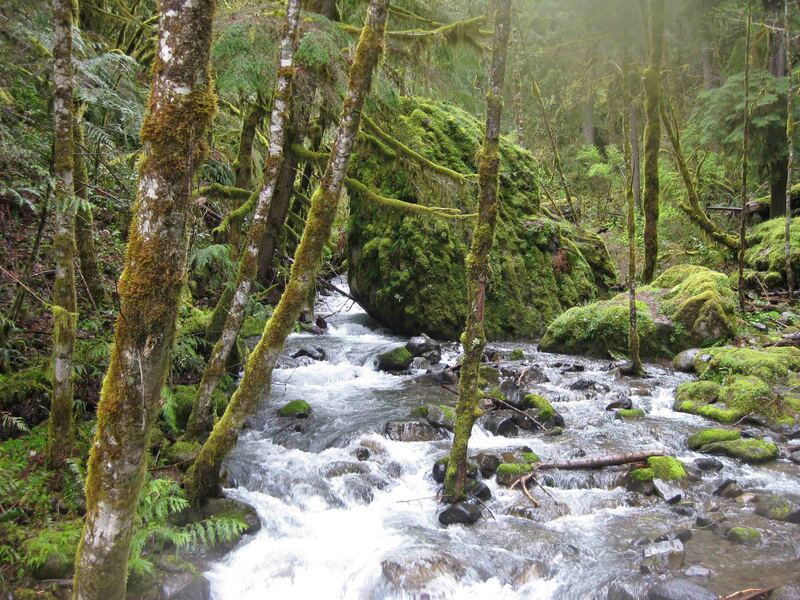 The combined force of the two rivers, however, broke through the Basalt and travel west to the Pacific Ocean. After a few short minutes in the cold rain watching the rivers collide, we moved on to Susan Creek Falls. 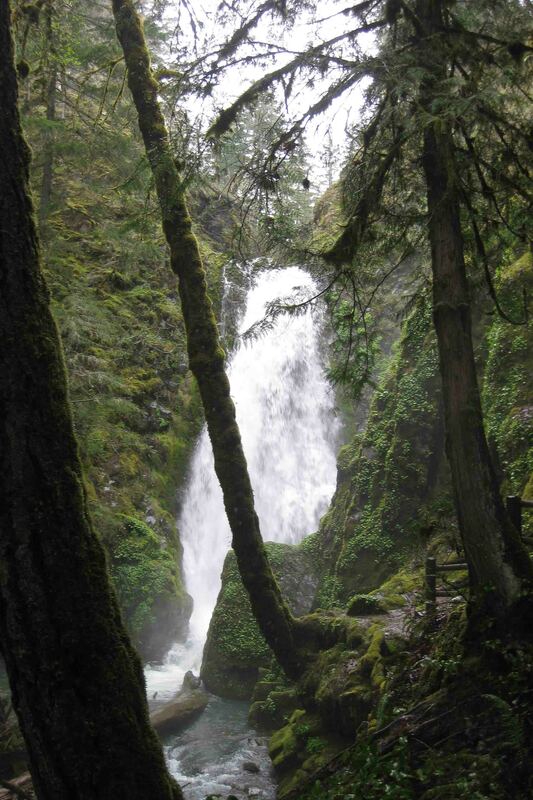 A crushed stone pressed trail led Petey and me 0.8 miles to a fan shaped waterfall that drops 50 feet over mossy rocks. As I donned my goulashes, parka, and hooded rain jacket, poor Petey braved the constant drizzle. I felt a bit sorry for him, but at the same time, I think he’d rather be on the trail than in VANilla. Upon return to VANilla, he got a good toweling off and rested in the warmth of the van while I took another hike at Fall Creek Falls just a few miles down the road. 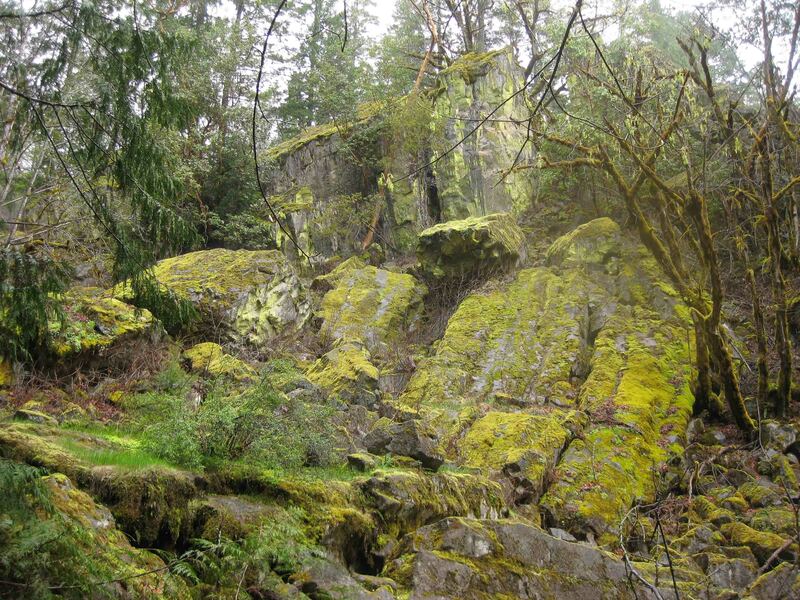 The path leads hikers through a narrow bedrock crevice, past lush vegetation and beneath moss covered trees to a lovely double falls with tiers of 35 and 50 feet. A spur route leads curious trekkers to a basalt outcropping as well. Knowing I had a long day in store for me, I almost skipped this two-mile jaunt, and I’m so glad I didn’t. 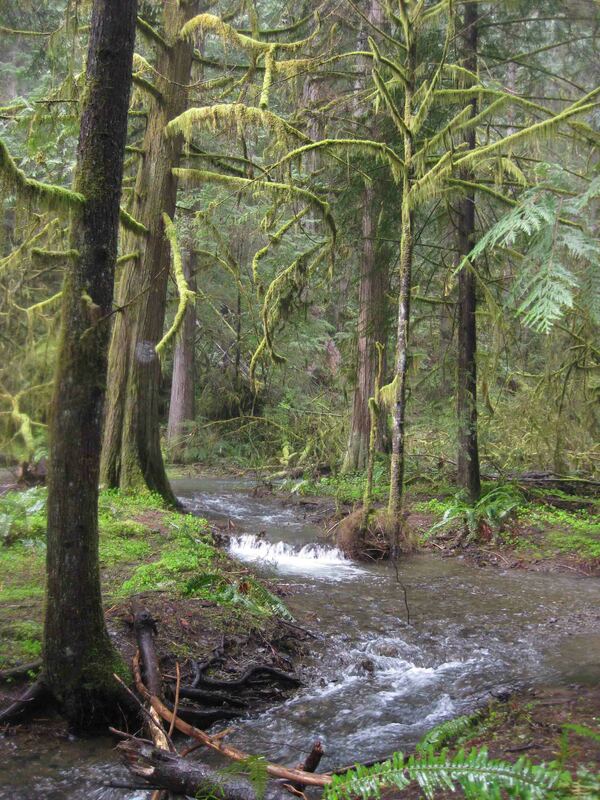 The walk through the forest with rain dripping from the rocks and leaves was just gorgeous. We continued a little further up the road to Steamboat where we took a six-mile side trip to Steamboat Falls located at the Steamboat Campgrounds. 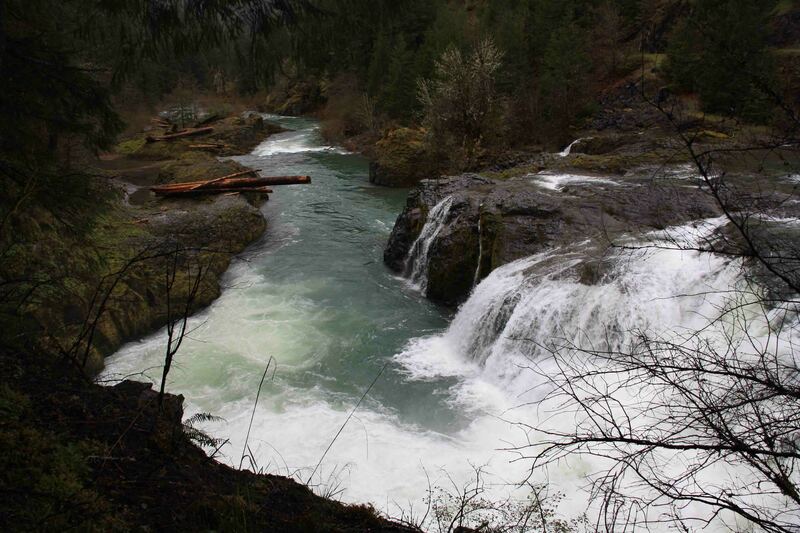 I was too early to see the summer ritual of steelhead attempting to jump the 25-foot falls adjacent to the fish ladder, but the falls and river still granted a fine view. 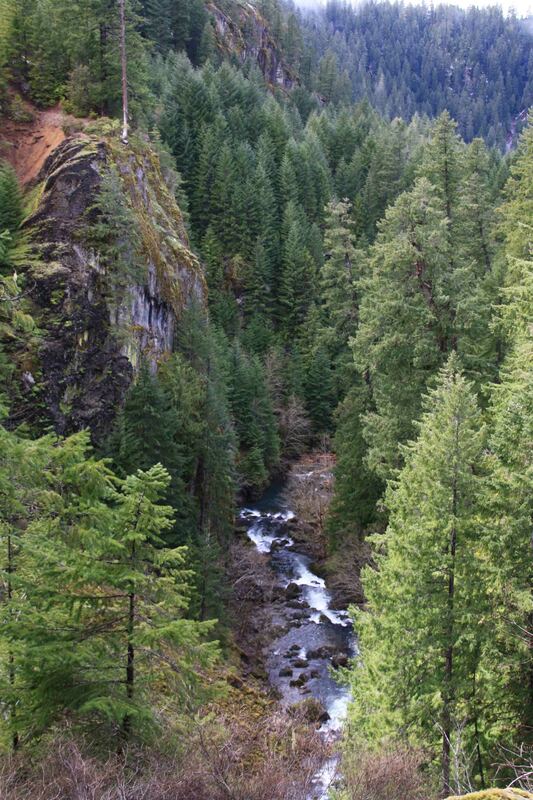 Our next stop was to see yet another waterfall…the Toketee Falls. 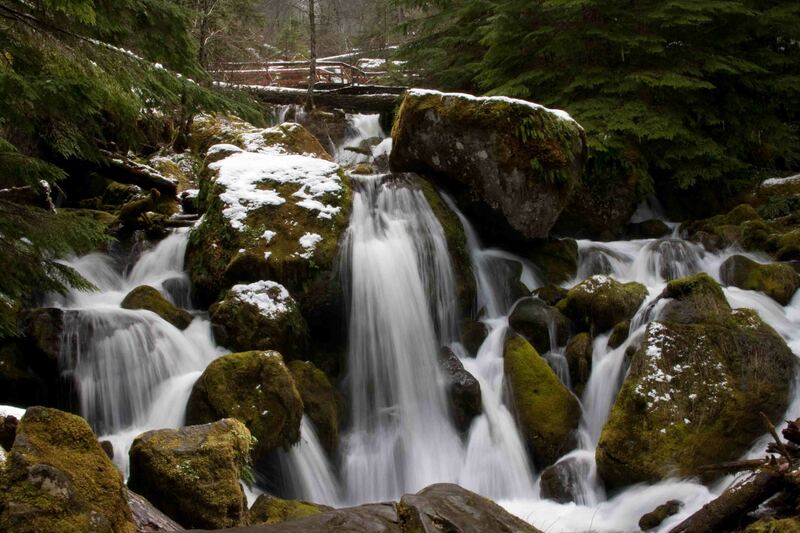 The nearly half mile path led us past mossy logs and rocks recently dusted in a light snow to a two-tiered falls that cascades through a narrow rock gorge. 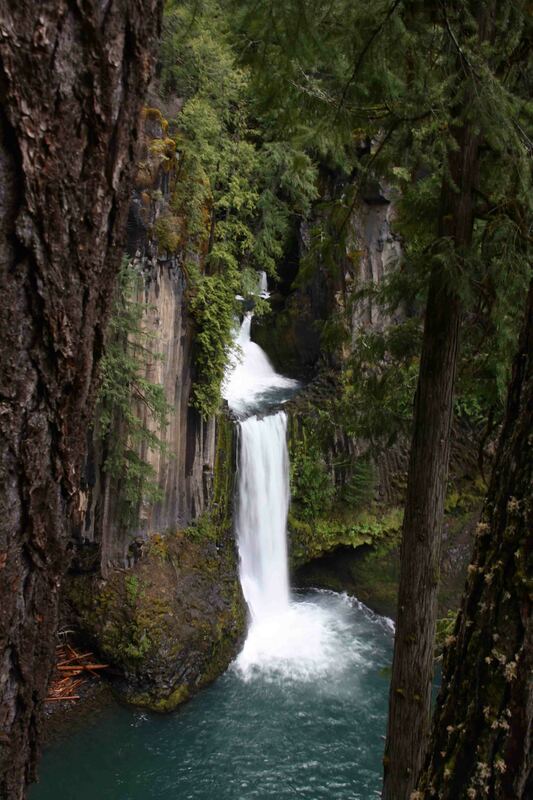 The upper falls drops 40-feet while the lower falls plunges 80-feet over a sheer wall of volcanic basalt. 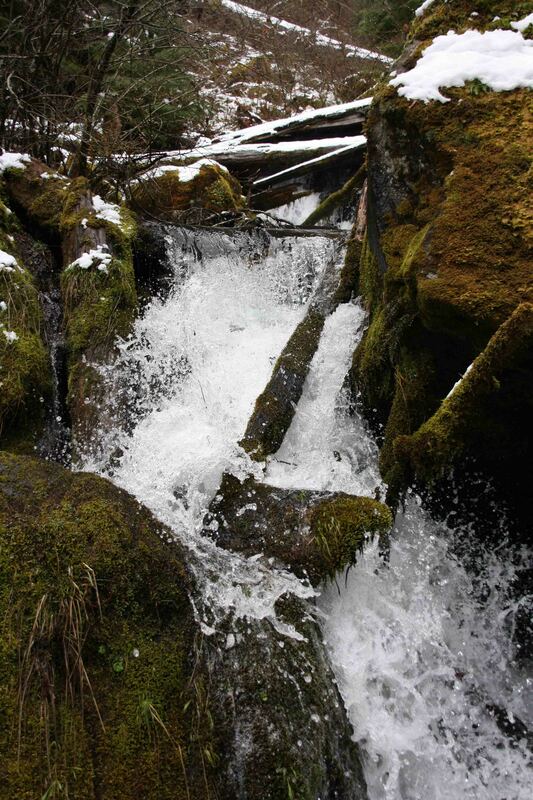 In the Chinook language, Toketee means pretty or graceful which are perfect words to describe this cascade. area. 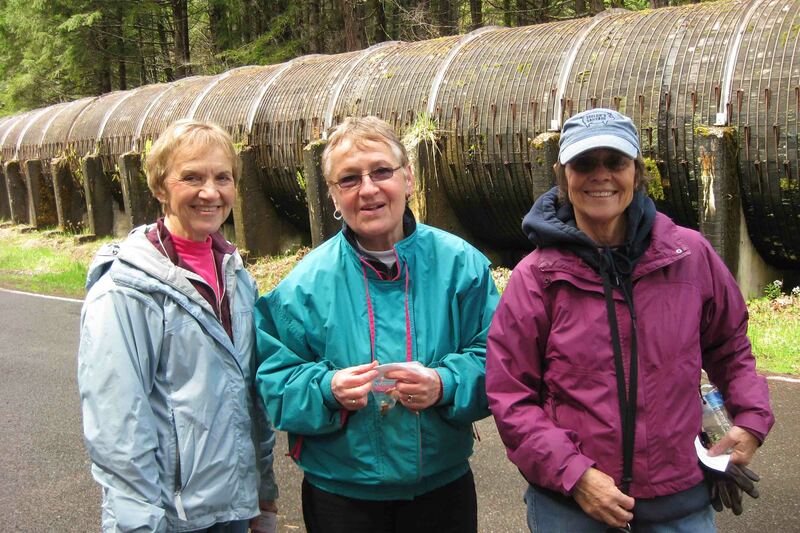 They were members of a women’s group that offers a variety of activities, one of them being a monthly outing to hike. 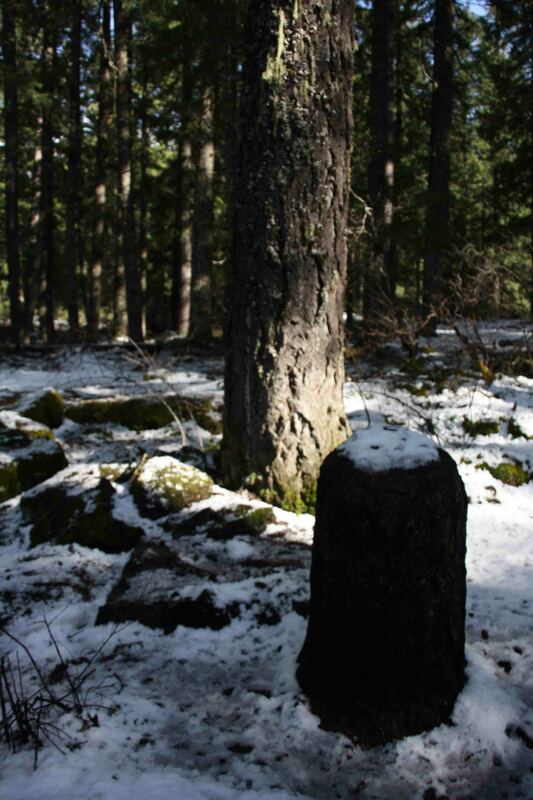 Their route required them to pass through the highest point in the area during heavy snowfall. “Could I make it over the pass?” I asked. Gerene, the driver, responded that she had her SUV in 4-wheel drive, but she didn’t think she needed it. 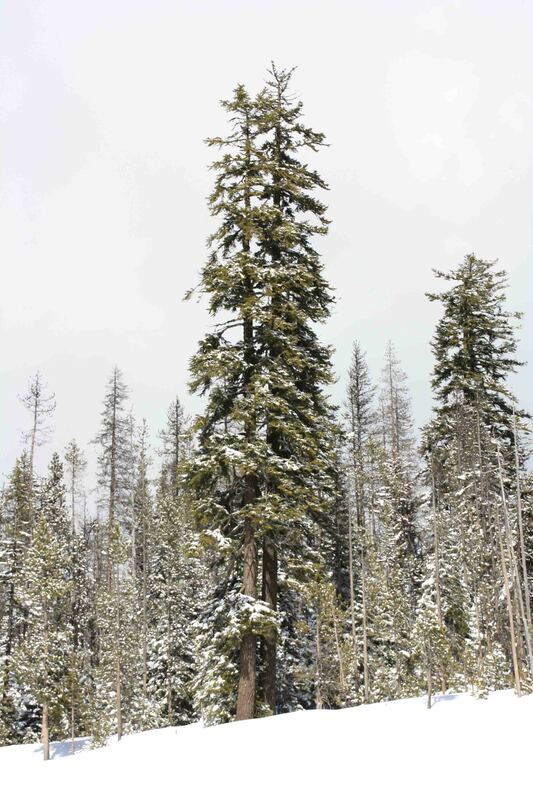 Another lady in the group showed me her pictures of four to six inches of fresh snow. Hmmm, the precipitation had finally let up and the sun began poking through the clouds, so hopefully with a little traffic and sand, the roads would be passable for VANilla. Project to be built. Water from a 102 acre reservoir enters the intake structure at the dam located about 1 mile upstream from the falls. It then passes through this flowline for 1,500 feet before it transitions to concrete just before entering a tunnel through Deep Leap Rock. The water powers three generator turbines that produce enough electricity for 22,500 homes. As we said our good-byes, Renate handed me her card and invited me to stay the night if I made it all the way down to the Medford area. 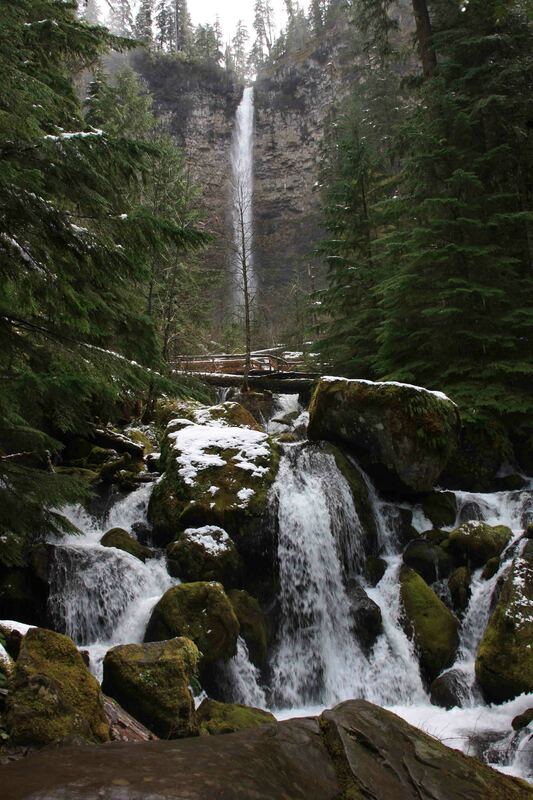 My fifth waterfall stop was only a few miles up the road and the difference in snowfall was tremendous. 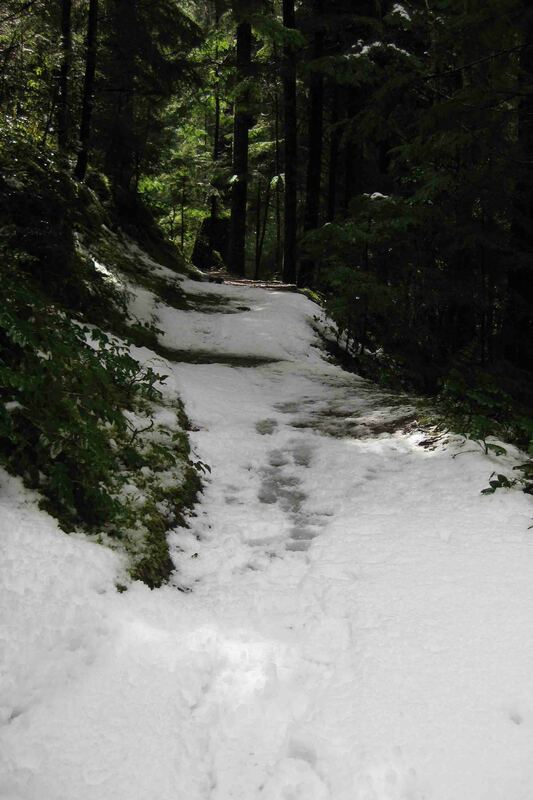 Several inches, though slowly melting away in the afternoon sun, blanketed the rocky hillside and path which led up to Watson Falls. 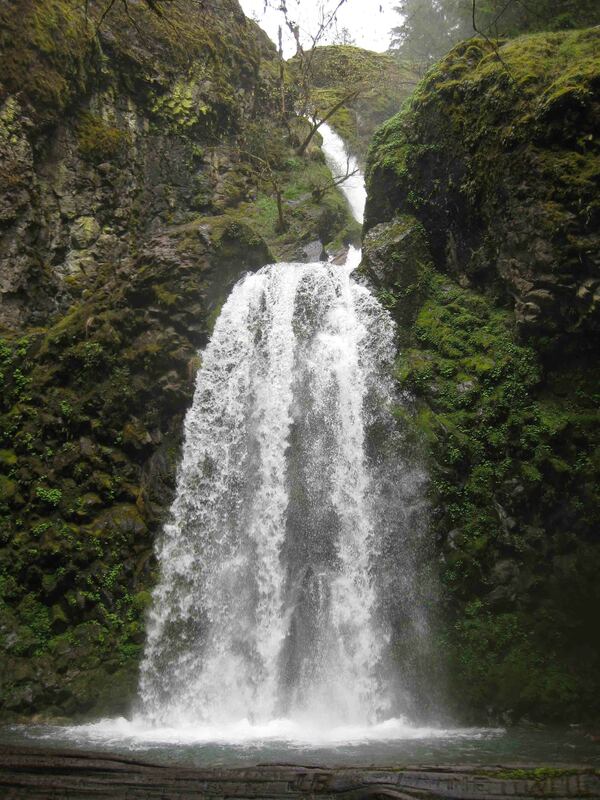 Plunging 272 feet, Watson Falls is the highest waterfall in southwest Oregon. As I urged Petey in and out of snow patches, I couldn’t help but think what troopers those ladies were as they visited these falls first. I’m certain they had to trounce through significantly more snow accumulation. By now, it was late afternoon, and I was still faced climbed the 5,000 foot pass and deciding if I wanted to take the less traveled road to Crater Lake. Fortunately, I only met a spattering of drizzle and a few small snow flurries as VANilla powered over a relatively clear pass. 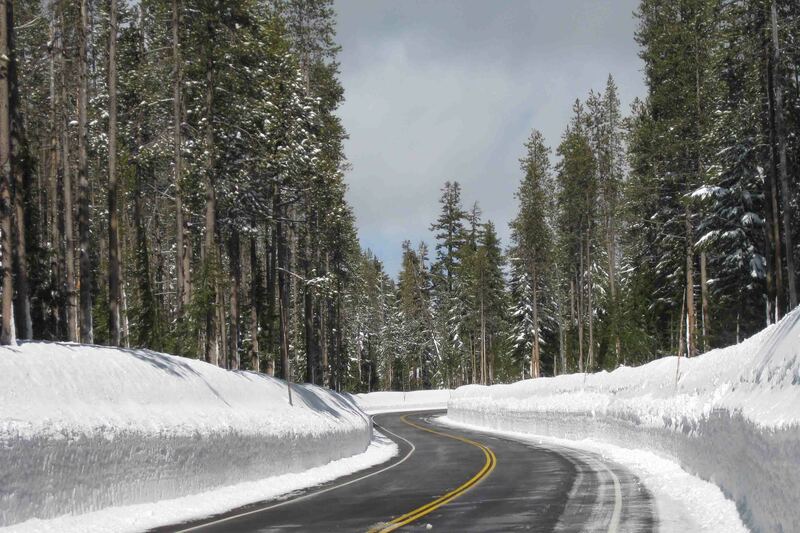 Despite four foot snow banks on either side of the road, we only crossed a few patches of snow on the main scenic drive. When I reached the road to the crater, the path seemed clear, so I took a left to drive five miles, according to Gina my GPS, to Crater Lake National Park. lane that was fully snow plowed was the opposite one to which I was traveling. I found myself having to drive on the wrong side of the road as I slipped around turns with 30 mph winding road signs posted continuously and hardly sticking out above the six foot snow banks. Furthermore, a SUV was barreling down the road behind me. The snow banks blocked any space available for slower traffic to yield. I was stuck plowing forward for several more miles. Finally, I found a small carve out where somewhat flustered, I pulled off and turned around as I wasn’t sure how much further I was going to have to go. It turns out, I think I was about 4 miles from my destination and as I sat on the roadside a snow plow passed by clearing my lane, but at that point it was nearly 5 p.m., I was tired and not knowing the weather forecast, I didn’t want to get stuck up there in a winter storm, so I will plan on revisiting the area in October. likely formed by the collapse of lava tubes and the force of the river as it followed fractures between the layers of lava. About three miles downriver, the river turns below ground. I will have to check that out in October as well. We continued on to cross a spectacular, rust colored bridge which spanned the aqua Rogue River which feeds into Lost Creek Reservoir. I wanted so much to find a pull off here for a photo. The only pull-offs weren’t conducive to a quick point and shoot photo opportunity, but rather required the photographer to hike up the highway a good quarter mile…maybe next time. Beautiful pictures and exciting blog about that part of the country.